Tea Party Nation organized and held the first national Tea Party convention in Nashville, Tennessee in February. (CNN) - A National Tea Party Unity convention that was scheduled to be held in Las Vegas in July will now take place in October, according to organizers. The event, organized by Tea Party Nation (a national Tea Party organization) and Free America (a conservative non-profit group) and other organizations, will still be held at the Palazzo Las Vegas Resort. But Tea Party Nation founder Judson Phillips confirmed to CNN Saturday that the date is being moved from July 15-17 to October in order to hold the event closer to the midterm elections. "We concluded it would more advantageous to hold the convention in the middle of October just prior to the November elections," says Phillips in a statement. Phillips says that he and fellow organizers were so excited about what they term the success of the first convention that they scheduled the second convention without considering the timing. "The heat in Las Vegas in July is keeping many who would like to participate from attending. We have also received numerous emails from people who were forced to decide between family vacations and attending the convention," adds Phillips. He also says that moving back the date allows other Tea Party groups to attend the convetion. Nevada Republican Senate nominee Sharron Angle was scheduled to speak at the July event. Tea Party Nation is encouraging activists to donate to Angle, who is challenging longtime Democratic lawmaker and Senate Majority Leader Harry Reid in this November's midterm elections. Conservative radio host Laura Ingraham and talk show host and former CNN anchor Lou Dobbs were also scheduled to address the convention. There's no word if the change of date will affect the list of speakers. Time to stop wasting MY taxpayer money on these wasteful socialized medicine program!! 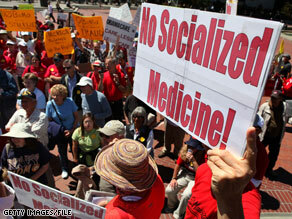 I like that " no socialized medicine " sign...Must be a medicare recipient holding it up. When are these folks going to learn? maybe they can also move their convention to MARS or better yet URANUS, which signifies where they get their stupid ideas. Where were all these Tea Partiers during the Bush years when that administration took us from NO DEFICIT to one in the trillions with their two wars, tax breaks for the rich, and few regulations on big business? Why weren't they complaining then about all the deficits and the hole the Republicans were dropping us all into. They're the ones who led us into this recession, and now Obama has to deal with all the ! @#$ left on his doorstep. And he has to do it with every single Republican in lock step blocking everything. Why in the world would we want to put the people who got us into this mess back into office? It makes absolutely no sense. Dang. These people can't even decide when to hold a meeting. Let me help you guys out. Wait until things quiet down some and have your meeting around Thanksgiving. That way everyone can break bread together over Thanksgiving Dinner. LOL! If you GOBPbaggers think July is a problem, wait til you compete with the MLB playoffs and World Series in October. Real Americans have priorities, and they don't involve your lying nonsense. Smart move. The Tea Party probably has many millions of supporters than the liberals realize. I know my 30 year old son and his friends are supporters but they don't have time to go to rallies because of their work schedules and limited family time. But they WILL be voting in November. Why is having the ability to get health care coverage socialized medicine? I'm sure that some believers in this teaparty movement are decent people, but I for the life of me cannot condone a lot of their beliefs. The deficit was out of control for 8 long years while the Republicans held the White House and for some time the congress as well. Not one of these people raised their ugly signs during that time. There was never a demand to take THEIR country back. When you observe these differences, it makes you wonder what the actual difference is. To me the one and only difference is President Barak Obama. This president promised to reform wall street finance, pass a health care bill and iniate a fair immigration bill. Two out of three is not bad in my opinion. With these accomplishments, he is called a socialist, he's compared to Hitler, he's accused of establishing death panels for grandma, there will black ops patrols coming to take your guns..the ridiculus goes on and on, but these are so called patriots??? The nearest comparison to this climate in ploitics today is during the McCarthy days when everyone feared for their careers by being labeled a communist. When are we going to wake up, take a stand and fight these nuts? Are we going to let November come upon us and these nuts or their supporters take over the reins of power in this country? To those of you that dismiss the tea party or it's doctrine, I warn you that you're making a big big mistake. This group has spokesmen all over talk radio. They have supporters that are actual elected officials in the Republican party. The lies they've told these past almost two years are told often enough that a vast number of Americans have come to accept those lies as the truth. There was a time in our not to long ago history that a country laugh at and took it lightly, a group who called themselves the People's Workers Party, and they eventually became known as the NAZI party. In this great country of ours, we tend to take our freedoms for granted. We are allowed to call our President a socialist/communist/facist and any other name we want but a child of God and no one finds it offensive??? NO socialized medicine?.. That means you want to do away with Medicare..Veterans Health Insurance...and the New Health Insurance Law...You agree with that statement T party people?.. You really like it when people have NO Health Insurance huh?.You like it when your friends the Private Health Insurance Govnerment Insurance.. cancels you at any time..deny you of coverage or price you out of the market.. They govern well on that .. Don't they?... So you are satisfied and sleep well at night if you have NO health insurance at ll ..Is that it? I'm with Bob! If the damn media would stop hyping them, they'd quietly self-destruct. Their mere existence is living proof that the American education system has disintegrated. I'm thinking of setting a sign-up booth for GED classes at the Tea Bagger (so dumb they don't even realized what their name means to a whole lot of us!) gathering. Watch out Sin City – here they come with their Medicare and their Social Security Checks. Nickel slots will be overwhelmed. Prune juice will be needed instead of alcohol drinks. On second thought, give them one alcohol drink and they'll go to their cars, tents, whatever they're cheap sleeping in, and take a nap. oh oh the fervent followers of Glenn Beck are at it again. Pathetic. Lets talk about socialism since this seems to be a thorn in the Tea party members @ss. How do those older tea party members seperate their Social Security check every month along with their Medicare card priviledges from their stupid signs stating NO SOCIALIZED MEDICINE? If these people are true to their convictions, at their next gathering,lets see a social security card and mediicare card burning. Lets see signs displaying their social security numbers so that the black ops people can notate them all down and remove these so-called patriots from the social security list as well as medicare. And the Republican Party align w/ this organization? Look like a crazy organization to me. I feel sad for the Republican Party ... a party of No, a party of no Backbone. With Tea Party Convention set for October, this would ensure television coverage 24/7 and thereby smother any Democratic late charge just before November's mid-term elections. Oh yes.. the media will be all over coverage of the tens of people that will show up at such events. The rest of us will be laughing... very hard! Come Nov. your 10% of the voting population should do wonders.